If any further evidence were needed to demonstrate how the power companies, both state-owned and private, have been foisting unnecessary price hikes on their customers, it can be found in the industry’s own energy forecasts. 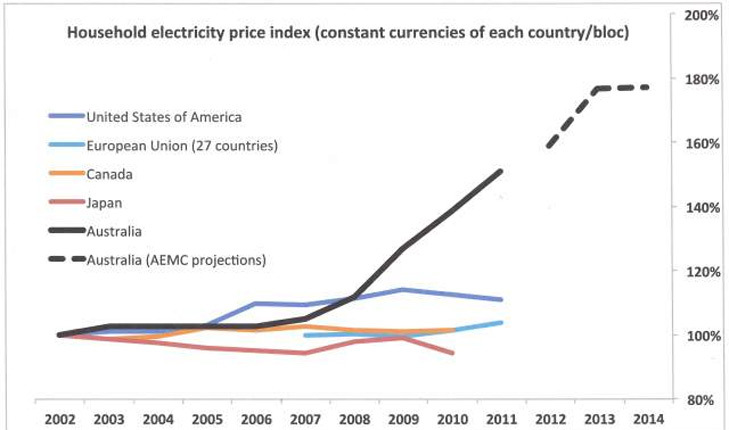 Forecasts of demand for electricity have a significant impact on the price of electricity. The higher the forecasts, the more money earmarked by industry for network upgrades in order to cater for this supposed increase in demand. In turn, the higher the financial returns for the industry players. Ironically, as the transmission and distribution companies earn a regulated return on their assets, they have a perverse incentive to spend for the sake of spending. Yet the great conundrum of the radical rise in Australian electricity prices – up 70 per cent in six years and poised to ratchet another 30 per cent higher this year and the next – is that consumer demand has actually been falling, and falling for years. Actual consumption in the National Electricity Network has been way out of whack with forecasts. For the past three years, the industry has had to downgrade its forecasts, and by a considerable margin. Still, they persist with forecasting large rises in energy consumption, even in the face of a clear downtrend in actual demand – and huge price rises at the retail level to boot. Not only has the electricity industry failed to recognise a change of trend in total demand, but in peak summer demand and peak winter demand too. These changes have been driven by one over-riding factor: price. Power bills are too high. Consumers are more mindful these days. They switch off their lights and their appliances to save energy. Climate change and green-mindedness play a part – as indeed the carbon tax has played a minor role in the price rises – but the blunt instrument of price has done the real work of inhibiting demand. Forecasts are determined by three things: supply, demand and price. Price is the key determinant. It is the one variable which is quickly and easily identified and cannot be argued about. It shapes consumer behavior. The importance of energy prices, to the individual, to business and to general economic growth cannot be overestimated. For the low income consumer, we have reached the point of “energy starvation”, to heat or to heat. The following graph from the Energy Users Association of Australia shows we are leaving the rest of the developed world for dead. 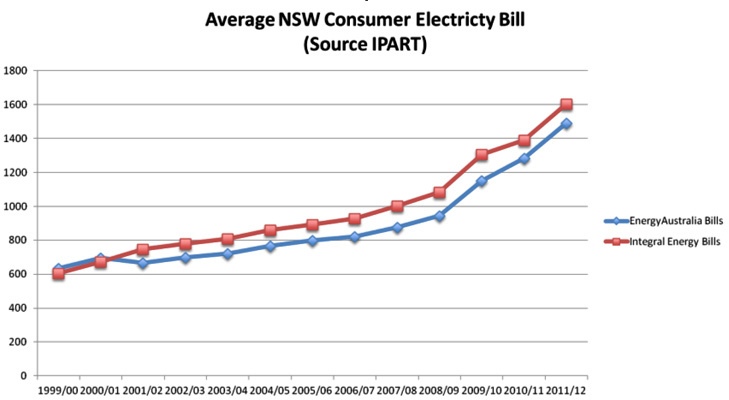 If the graphic above shows starkly just how prices in NSW have escalated over the past three years – and other states mirror this trend – the graphic below is the perfect counterpoint. It shows actual demand, and just how wildly wrong the forecasts are. There are two possible conclusions as to how industry has got it so wrong: one, gross incompetence and, two, wilful blindness. Given the fundamental flaw in the industry structure, that is, the paradox of the regulated returns inducing excess spending, the latter explanation seems more plausible. Energy price forecasts have also under-forecast rises in electricity retail prices across the NEM, leading to a compounding effect, with economic forecasts being too high, leading to electricity forecasts being much higher than actual demand. It would have been far more precise to have kicked off the booklet with the heading “National Forecasts Totally Hopeless”. According to corporate analyst turned farmer, Bruce Robertson, the power companies have been continually downgrading their forecasts and haven’t come close to getting them right even 12 months out, let alone for the 10-year view required to efficiently allocate capital for network upgrades and expansion. Transgrid is the NSW transmission operator with whom Robertson and a group of locals on the mid-north coast of NSW have been having a stoush. As the network provider, it builds the enormous coat-hangers and has been adding to its asset base big-time amid speculation it could now be fattened up for sale by the state government. It is also proposing to build power lines through the Manning Valley, a development plan Bruce Robertson says is completely unnecessary as demand for power in the area is falling. He points to the 2011 Electricity Statement of Opportunities (ESOO) where Transgrid had to pull back its forecasts substantially. “The real picture is that annual energy consumption for 2011–12 is 4.1 per cent lower than 2010–11, and 5.6 per cent lower than was forecast in this 2011 Electricity Statement of Opportunities (ESOO),” says Robinson. Indeed average growth in annual energy demand for the ten-year outlook period is now tipped to be 1.2 per cent, down from the 1.6 per cent forecast in the 2011 paper. That is a big deal, a 25 per cent reduction in the long-term growth rate in annual energy for NSW in just one forecasting period. In only two years Transgrid and the AEMO forecasts for 2020 have been revised down by 16 per cent. Neither is peak demand any longer the thorny issue it used to be. Much has been said about peak summer demand being the problem as the system cannot cope with the spikes in demand when everybody switches their air-conditioning on during those blazing hot days. It is peak demand which has been cited time and time again to justify over investment in the grid. “This assertion has proven to be false as the industry now has the same ten year growth rate in NSW for both peak and overall energy demand,” says Robertson. Transgrid no longer does the forecasts for NSW in the Electricity Statement of Opportunities. The Australian Energy Market Operator (AEMO) now does them in a similar document called the National Electricity Forecasting Report. AEMO is funded 40 per cent by the electricity industry and its critics charge that, as the industry “planner” it is vulnerable to regulatory “gaming” by the power companies keen to enhance their regulated returns. He argues the AEMO model does not fully take account of the dramatic and sustained rises in the price of electricity. “The inputs to the model assume a fixed component to all consumers regardless of price,” he said. A spokesman for AEMO spokesman said it used real prices in its forecasts as opposed to nominal prices which factored in the CPI. “Rising electricity prices and low economic growth can significantly affect electricity demand. This was the specific context for including electricity prices in AEMO’s inaugural National Electricity Forecasting Report published in June,” said a statement.